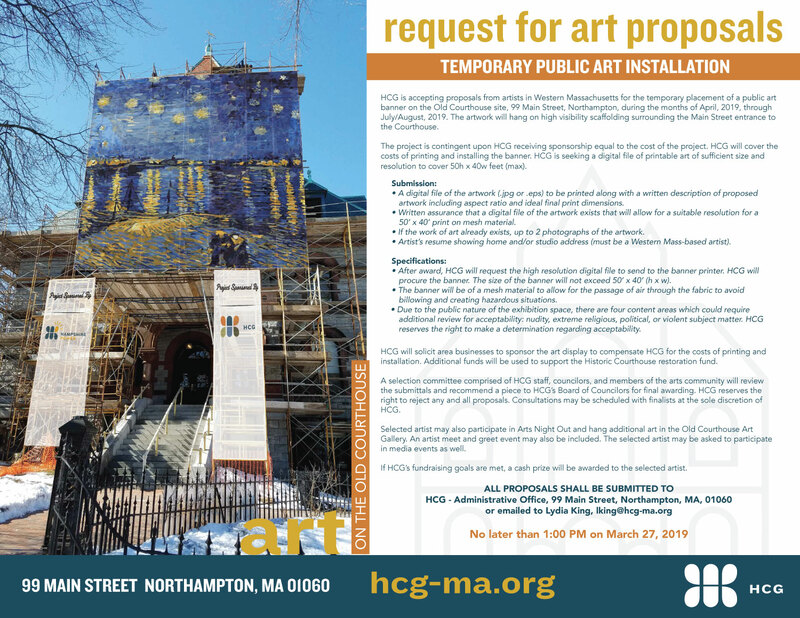 HCG is accepting proposals from artists in Western Massachusetts for the temporary placement of a public art banner on the Old Courthouse site, 99 Main Street, Northampton, during the months of April, 2019, through July/August, 2019. The artwork will hang on high visibility scaffolding surrounding the Main Street entrance to the Courthouse. The project is contingent upon HCG receiving sponsorship equal to the cost of the project. HCG will cover the costs of printing and installing the banner. HCG is seeking a digital file of printable art of sufficient size and resolution to cover 50h x 40w feet.